Robert Brown’s Killjoy returns with this third issue of quietly understated but oh-so familiar childhood recollections that will, in turn, make you smile, wince and nod knowingly at his spot-on depictions of those most awkward rites of passage. Earlier instalments of Brown’s autobiographical comic have jumped back and forth in time. 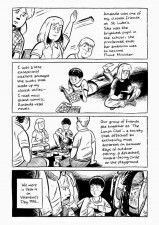 The first issue presented a longer-form account of the regimented horrors and injustices of scout camp while the second focused on a number of smaller vignettes from a younger Robert’s life – the humiliation of a revealed crush, clandestine missions to sneak downstairs and watch the forbidden Beavis and Butthead, and the terror of being separated from your parents when out in a public. Killjoy #3 reverts to the issue-length story format, though in reality there are a number of smaller tales here that are essentially linked by one ongoing story arc. 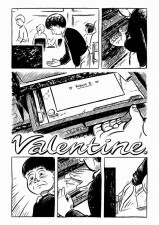 The subtitle for #3 is ‘a cartoon study of preadolescent romance’ and the 24-page feature ‘Valentine’ certainly captures the implications of that tagline in all its uncomfortable, cringeworthy clumsiness. The scene is set when heretofore innocent chums Robert and Amanda – having reached the heady heights of Year 4 at St. Luke’s school – become entangled in a somewhat gauche playground courtship. It begins with the embarrassment of our Robert finding an anonymous Valentine’s card in his desk in class and through a circuitous route of “my friend really likes you”-style interventions he eventually caves in and agrees to become sender Amanda’s boyfriend. What follows is a catalogue of graceless social ineptitude that is both painfully observed and cleverly realised in all its squirm-inducing glory. From Robert’s obtuse misconceptions as to what “going out” with Amanda means (“I just want to know where we would go out before I decide”) to the strange three-way relationship that develops when he insists his friend Ben tags along with them it’s one excruciating anecdote after another. 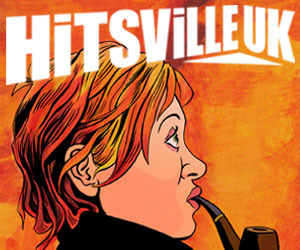 Of course, the reason that readers connect with Robert Brown’s comics to the extent that they do is that the events within are not just recognisable… they’re also ones we have all lived to an extent. 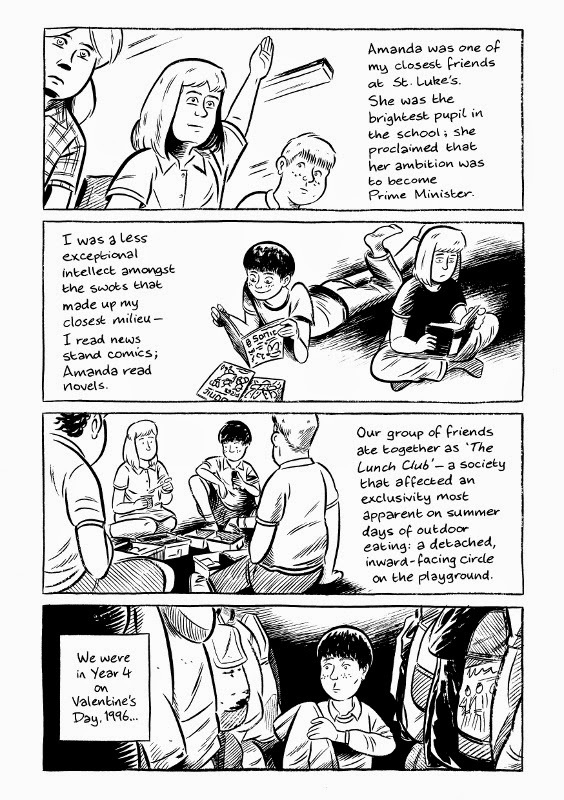 So Robert’s oblivious behaviour and his poor handling of just about every situation in his relationship with Amanda – a classroom denial of their boyfriend/girlfriend status for example, or his cruel rejection of her to retain his social status – will remind many readers of those callow days of schoolyard politics and bumbling dealings with the opposite gender. As ever in a Robert Brown comic the story is carried with little exposition but with a refined sense of visual characterisation. So much can be communicated in Killjoy about a character’s thoughts or state of mind in just one meaningful facial expression. 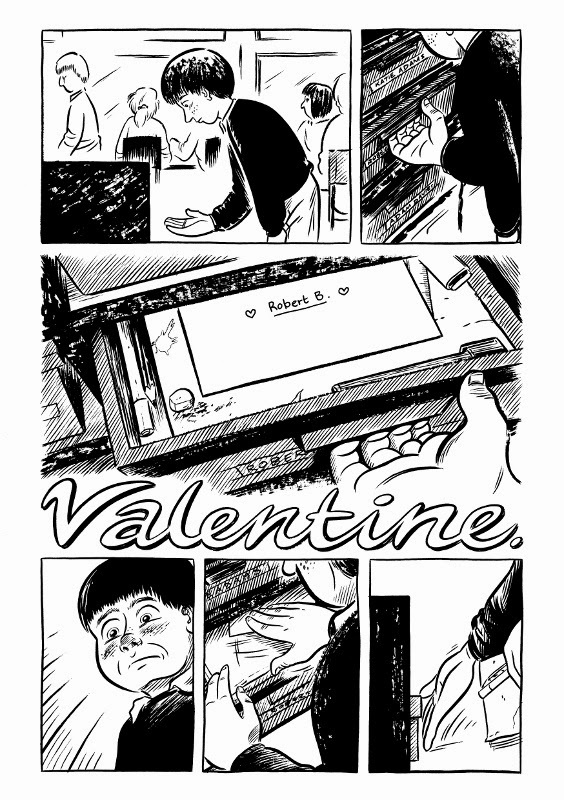 Just take a look at the scene above and that look of absolute bemusement on finding the aforementioned Valentine’s card squatting malevolently in his desk. It’s a technique that is particularly pertinent in this issue in conveying Robert’s sense of confusion and bewilderment about his newfound situation. Despite his relentlessly unjust treatment of Amanda the audience never entirely loses sympathy for him though. Brown the writer is subtle enough in his depiction of his younger self to remind us that Brown the protagonist is, when all is said and done, largely a confused little lad completely perplexed by this change in his status quo. 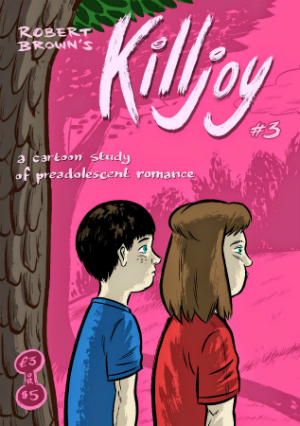 Where Killjoy #3 is a little less successful is towards the end of this issue. While the denouement is a neat thematic tie-up of story threads there’s a change of pace just prior to it that feels a little disjointed in the wake of the careful story build-up through the rest of the issue. 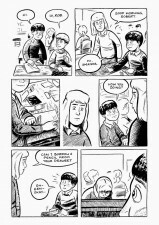 Regardless of that small point, Killjoy continues to be one of the most articulate autobio comics on the UK market. My only true frustration about Robert Brown’s work is that there’s such a small back catalogue to date. Few comics creators make you live their characters in quite the same way he does. 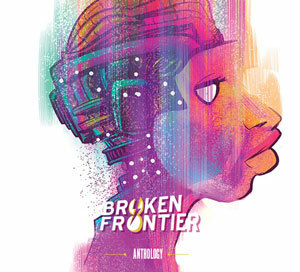 For more on Robert Brown’s work check out his website here. You can order copies of Killjoy #1-3 from his online store here priced £2.00 for issue #1 and £3.00 for issues #2-3. Alternatively you can buy a bundle of all three at the discounted price of £7.00. 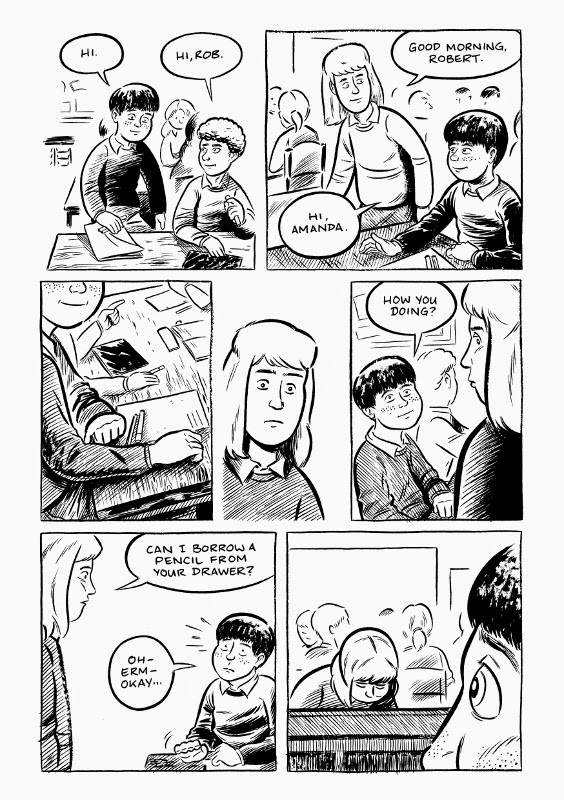 Celebrating Small Press Day 2016 – Ten Top UK Autobio Comics for Your Consideration!